St. Patrick’s Day isn’t just for kids, in fact, it’s a pretty awesome holiday for adults to celebrate. There are so many things you can do to ensure you have the best St. Patrick’s Day! 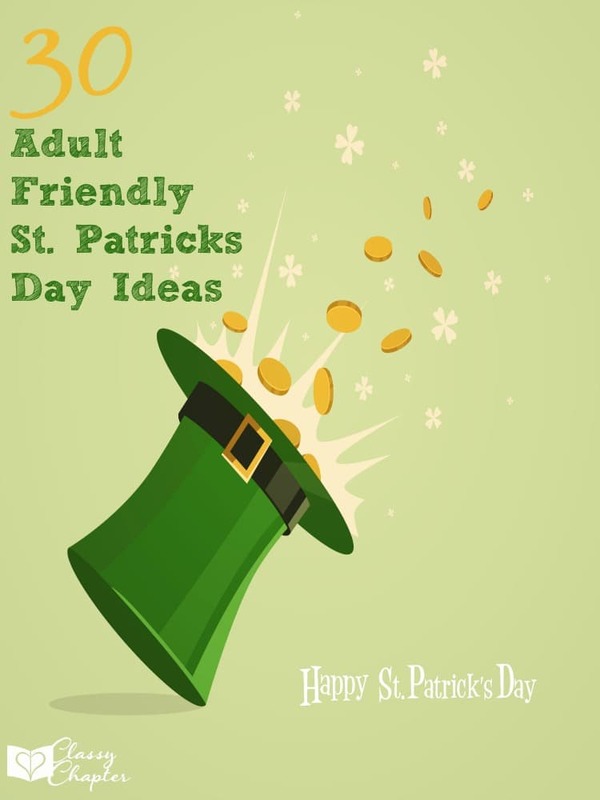 I’m sharing some of my favorite St. Patrick’s day party ideas for adults. 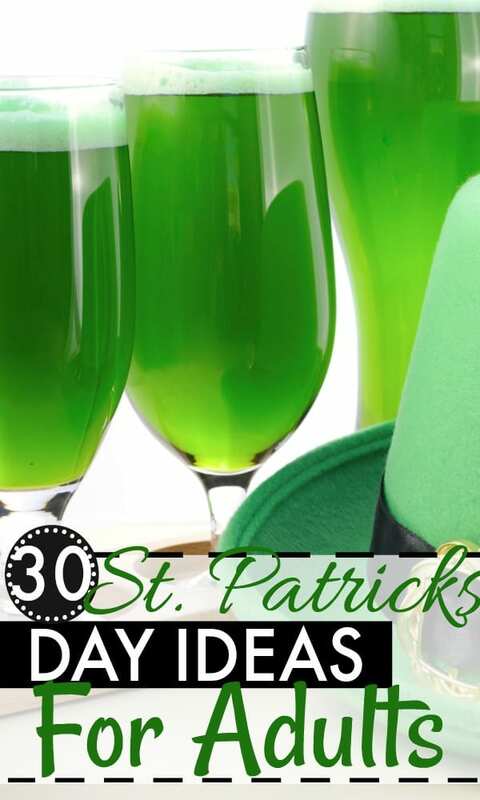 Let’s make this St. Patrick’s day the best one yet with these 30 St. Patrick’s Day ideas will ensure you have a blast this holiday! 1.Throw a house party! Invite the neighbors or coworkers over for a fun night of St. Patty’s Day fun. You can even try one of these yummy desserts! 2. Dress up like a leprechaun! Have a fun day at work where everyone dresses up as a leprechaun. Best costume gets all the gold. 3. Create this super fun and cute St. Patrick’s Day jello shots! 4. Play musical chairs at your St. Patrick’s Day Party. You thought this game was fun as kids, wait until you play as adults. 5. Have a cabbage eating contest. See who can eat the most cabbage. The winner? They get taken out for a real meal after their stomach heals. 6. Play a game of poker, but use gold coins instead of real money. The winner gets taken out for drinks. 7. Adult bingo! Make a St. Patty’s Day version of Bingo. 9. Craft day with the ladies! St. Patrick’s Day is the perfect chance to have a craft day with the ladies. The guys can have a guy’s night out drinking lots and lots of Irish Beers. 10. Spend the evening creating your own adult St. Patty’s day beverages. No rules apply. 11. Try this yummy green drink! 12. Truth or dare Irish style. There are no rules to this game, wimps need not apply. 13.Come up with the best St. Patrick’s Day themed song before the drinking starts and then come up with the best song AFTER the drinking stops. 14.Make your favorite St. Patrick’s Day desserts. Don’t worry, calories don’t count. 15. Beer tasting! Spend the whole night tasting new beers that you’ve never tried before. 16. Pin the Shamrock on the Leprechaun. Make this as fun as you can. 17. A game of basketball where all players are wearing top hats. 18. Have a dinner party. Everyone has to dress up in all green and only green drinks and food are served. 19. Gold coin hunt. Send everyone on a hunt to find the most gold coins. The winner gets a cash prize. 20. Hot Potato St. Patty’s Day style. When the music stops on you, you HAVE to take a shot. 21. Have a contest for the “greenest” person at the party. Everyone else has to treat this person like a king or queen all night. 22. Have a contest for who has the best Irish accent. This game could go on and on and on. 23. Love Irish food? Throw a contest and see who’s really the best cook in the land. 24. See who can blow up the most green balloons in five minutes. 25. Dress up. Gather in teams and pick one culprit. The culprit has to get dressed up like a leprechaun and their teammates are in charge! 26. See who can make the grossest food item of all. The rule is that all food items have to be made out of something green. You can also see who can create the best St. Patty’s Day dish out of these items. 27. Play music! See who has the most musical talent when it comes to Irish tunes. 28. Race for the gold. Hold mini races and see who can win the most gold coins. The only catch is these gold coins are real. You are literally running for the money! 29. Car decorating contest. See who can decorate the cars the best in St. Patty’s Day décor. 30. See who can draw the best four leaf clover after a shot with their eyes closed. No cheating. If you are looking for activities to do with the kids, check out this March Bucket List for Kids. As you can see, there is a lot of fun behind St. Patty’s Day adult activities. Enjoy these activities as much as you can on the very greenest day of the year. Love these ideas! So many people focus on fun for the kids, but St. Patrick’s Day can be a lot of fun for adults, too. I think I’m going to try my hand at a minty drink to celebrate! The minty drink would be so yummy. Blog post! This list is great! Except for the cabbage eating contest – yuck! lol Where did you get that idea?! A few years back, my friends and I would go to Scranton where the bars would open at 7am before the big parade. My stomach couldn’t handle that anymore now. Michelle Westbrook recently posted…What’s Making My Heart Happy? Oh goodness, there is no way my stomach could handle that either. Haha, the eating cabbage contest is a real thing…not one I would participate in, but it is real. Such a great list of ideas. I enjoy having family and friends over for any reason and can see using many of these! Thanks for sharing this at the This Is How We Roll Thursday Link Party! Can’t wait to see what you bring to the next party!